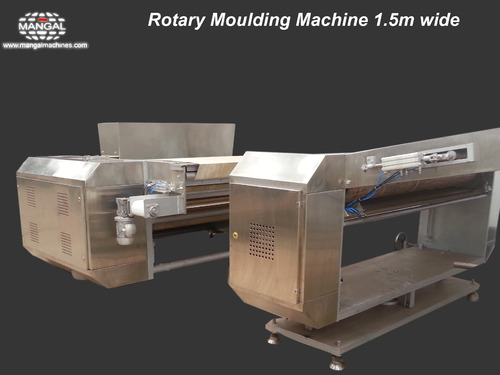 The machine is required to make the desired shape out of the soft dough fed manually or automatically into the machine. Fully automatic, adjustable forcing & rubber rollers, pneumatic web tracking control, separate speed control for die roll, extraction web and swiveling web, automatic consistent product weight control through servo control system, low height type. As per the length and width of the ovens available size from 800mm to 2000mm for upto 5000 kg / hr production. Quick die & web changeover design. Fully automatic controlled by VFD, HMI display & PLC. Automatic Servo weight control system as an option. All contact parts in stainless steel.